Being a pregnant Instagram influencer can’t be particularly easy, as everyone seems to have an opinion on what you’re doing – which is exactly what Australian fitness star Kayla Itsines is quickly discovering. In December, the 27-year-old personal trainer announced she was expecting a baby with her fiancé Tobi Pearce, and has continued to post workout videos and snaps of her growing belly in the gym. You might know Itsines from her fitness eBooks the Bikini Body Guides (BBG), or her hugely popular app, Sweat with Kayla. She adds: “I do not lift heavy weights, in fact I’ve cut the weight in HALF that I usually use. For the mums who have had kids… you would be the first to agree that there are PLENTY of things heavier than 5kgs in your house that you would have to lift or move daily (including other children). While it’s natural to be cautious, and there may be certain circumstances where avoiding some forms of strenuous exercise might be advised for some women during pregnancy (it’s always best to speak with your own doctor and midwife if you have any concerns or queries) – generally speaking, being pregnant doesn’t mean exercise is banned. It’s misguided to think exercise might ‘harm’ the baby, but of course you still need to be careful and listen to your changing body. Itsines has altered her normal workouts by reducing the weights she’s using, as well as cutting out things like jumping and excessive ab exercises. 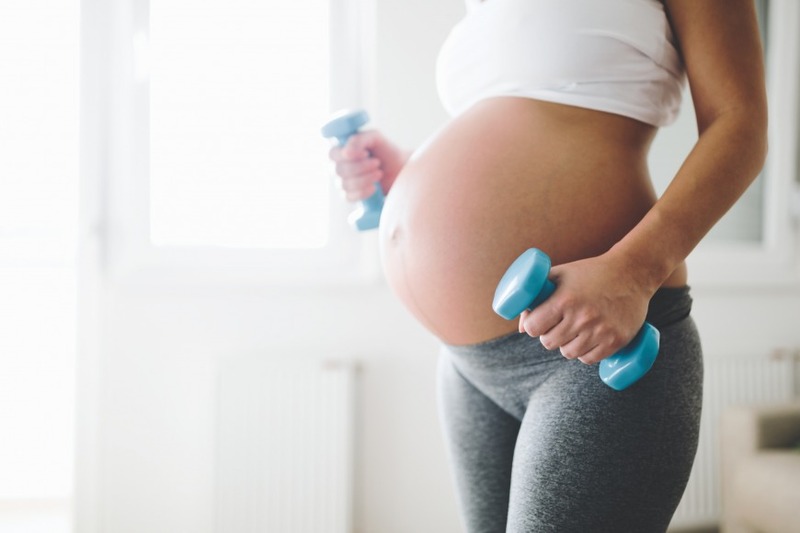 Like Itsines, Irani recommends lifting lower weights than you were doing pre-pregnancy, and says you could instead look to increase the amount of repetitions you’re doing during workouts. “Weight-lifting is good for keeping the muscles toned and the joints flexible, and can benefit women whether or not they are pregnant. The important thing is if something feels ‘not quite right’ then stop doing it immediately, and don’t start again until you’ve talked to your GP,” she advises.